Linlithgow Academy fencers struck gold when they competed at the Scottish Secondary Schools Team Championships. The event, staged last weekend, saw both boys and girls compete in the epee and sabre events on Saturday while on Sunday it was the foil competition. 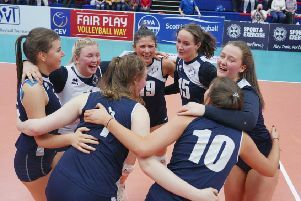 Linlithgow Academy lifted a haul of medals across all age groups but a special mention go to the senior boys A team as they fought their way to a hat-trick of golds. In addition to the medals and winning trophies, style awards were also on offer throughout the day. These awards were given out to one boy and one girl in each weapon based on correct technique, perfect footwork and applied performance. The style award winners for epee were Adam Bryson from Dunblane and Martha Morrison from Linlithgow. For sabre, the recipients were David Moody of Linlithgow and St George’s Normandy Simpson-Yeoman. In the foil event the style awards went to Luke Davidson and Eilidh Hall both of Linlithgow Academy.